ECGRA invests over $77,000 throughout Erie County. 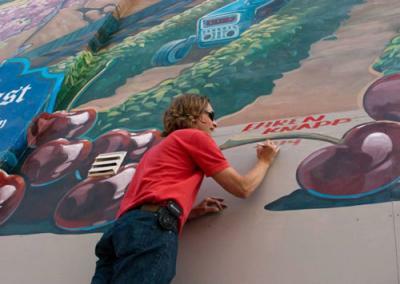 Local artist Ehren Knapp signs the mural he painted on the side of the Grape Country Marketplace in North East. The Mural celebrates the local grape culture. Does anything exemplify the unique qualities of a community better than our town centers? Erie County is fortunate to feature several of these "main streets" – places where foot traffic still fuels small businesses and our history is visible in the architecture. In our era of strip malls and social media, these homegrown commercial corridors are often neglected and fall into disrepair. Thankfully, some exciting upgrades are in store for our local community. On June 26, seven local organizations were awarded $77,530 in funding from the Erie County Gaming Revenue Association (ECGRA). The money comes through an ECGRA initiative created to encourage commerce, job creation, tourism, and community pride in our downtown corridors. It's called the Mission Main Street Program, and it specifically targets the walkable town centers that "give you a sense of civic identity," according to ECGRA's Executive Director Perry Wood. Here's how it works. ECGRA, a grant-making organization that supports local nonprofits, is funded through a small portion of the gross revenue of Presque Isle Downs and Casino set aside for community investment by the PA Department of Revenue. The Mission Main Street Program allots financial support to qualifying nonprofit organizations and municipalities through a 1:1 cash match for proposed projects. The funding can be used for many purposes, including construction, marketing, outcomes measurement, and insurance. It can't be used to pay off debt, to account for travel expenses, or for memberships or subscriptions. But enough about rules and regulations – let's explore where the money is going. A $15,000 grant was awarded to Erie Downtown Partnership Inc. to help renovate existing structures through its Facade Grant program. According to Assistant Director Christina Katen, the program is "designed to allow any property owner or business owner within the downtown the ability to obtain matching funds for work that they do to improve the street-facing side of their building." The Facade Grant Program was originally set to fund 10 projects, but with support from ECGRA, they can increase that number to 13. In addition to preserving historic buildings in need of repair, Katen hopes that the renovations will create "a feeling of cleanliness and safety" in downtown Erie, which will encourage more foot traffic for small businesses. The applications are currently under review, and according to Katen, there are plenty of "qualified, excellent projects" awaiting implementation. Downtown Erie isn't the only place expecting a facade facelift – another $15,000 will go to Downtown North East Inc. for similar purposes. The organization is implementing a facade renovation program through which eligible businesses can receive up to $2,000 in funding for exterior improvements along Main Street. The program is part of a much larger vision for the North East community. In 2010, with support from Mercyhurst University, Downtown North East, Inc. opened the Grape Country Marketplace, which offers everything from locally made jewelry to original works of art. To see what ECGRA funding looks like in action, one simply needs to gaze upon the beautiful mural by local artist Ehren Knapp on the side of the building, which was unveiled on June 21 and produced with money from last year's Mission Main Street grant. According to Charlene Kerr Piper, chair of Downtown North East, Inc., "the main goal of these efforts is to increase traffic in the downtown so that all the businesses can be a bit more profitable, that we can fill empty storefronts, and that we can provide the goods and services that the residents of North East require." The Union City Community House Association has a wider variety of plans for their $15,000 in Mission Main Street funding. They're working with several local organizations to make small-scale improvements (lamppost banners, window improvements) as well as larger ones (a portion of the funding will be used to help create a recreational pavilion). Some of the money will go to marketing for Union City's "Buy Local" program, an initiative designed to increase revenue for small businesses. According to Treasurer Sherri Huntley, the program follows the National 3-50 project, in which "consumers spend $50 in three local stores each month and receive incentives for doing so." Later in the year, Union City's "Christmas on Main" event will highlight the importance of small businesses as well. In 2013, a Mission Main Street grant helped the Union City Community House Association implement its "Union City in Bloom" project, which brought more than 70 flower planters to the downtown area. According to Huntley, this year's funding will encourage more progress in the future: "This spring we have once again planted the planters, replaced 13 windows in the facade of two of our downtown buildings, and we are working on new 'Welcome to Union City' signs... we are using the momentum of these projects to preserve, promote and enhance Union City's Downtown." In 2013, the Waterford Borough Council's Parks Committee used Mission Main Street funding to build a traditional gazebo in the main park along High Street. This year, the borough will use its $7,000 grant to extend the park's makeover through attractive landscaping designs from contractor J.J. Wurst. Two large arbors will be installed at each of the entrances leading into the park to welcome visitors. Presently, memorial bricks honoring Waterford's heritage are scattered throughout the grounds, where they are vulnerable to damages. To maximize strong connections to the community's past, these stones will be consolidated and directly incorporated into the design of the walkways. More work is on the way for the gazebo as well. When I spoke to her about the plans, Waterford Borough's Vice President Karen Molitor joked that the gazebo is like "a mannequin that's got no clothes on it yet," but that it will soon be "dressed up" with new plant life and a repaved central octagon. Molitor hopes that the transformation will be complete before August. The improvements are part of the Borough's five-year landscaping plan for Waterford's town center, which includes a number of other community improvement initiatives sponsored by the Greenways Trail and Recreation project, an Erie County Greenways program grant and other organizations. Speaking of Waterford, the Fort LeBoeuf Historical society received $3,180 for upgrades to the historic Eagle Hotel. You might know the hotel because of Sugar 'n Spice, the Amish-style restaurant located on its premises. Since the hotel was constructed in the 1820s, it requires occasional maintenance. Accordingly, iron handrails are scheduled to be installed on its front steps and improvements will be made to its roof and gutters. In 2013, McKean Borough began implementing a five-year plan to address sidewalks in the region by replacing 500 feet of aging pavement. This year, they'll use Mission Main Street funding to double that amount, with space along Route 99 as the primary focus. Many of McKean's sidewalks have not been upgraded since the seventies, long before the Americans with Disabilities Act. The new sidewalks will be ADA compliant, which will come in handy on McKean Community Day, Aug. 23rd. According to McKean Borough Zoning Officer Tim Weaver, "the purpose of this day is to help raise funds for beautifying the McKean Community. We are planning a golf tournament, car show, craft show, kids events, bands, and fireworks." Finally, $9,850 has been allotted to the Corry Community Development Corporation for a variety of projects. They will partner with the Corry Area Historical Society to create interpretive sidewalk panels highlighting Corry's heritage during the 19th and early 20th centuries. Executive Director Steve Bishop hopes to "make the downtown more user-friendly" through additional benches, waste baskets and flower planters. He is also excited about a lamppost banner project that will highlight Corry's "Try Local, Buy Local" initiative, designed to "make cash registers ring a little bit more" at small businesses. At ECGRA's Mission Main Street Workshop on May 16, Preservation Erie Board Member Melinda Meyer introduced the idea of the "storyscape" as a way to think about urban and suburban renewal. She encouraged the audience to think about "all of the stories of a location," in addition to its commercial or aesthetic potential. Community investment can support fading memories in addition to aging structures. With grassroots support and a lot of hard work, Mission Main Street helps us connect to our past while investing in our future. Dan Schank can be contacted at DSchank@ErieReader.com.